Is this the world's most valuable Pineapple? The Lost Gardens of Heligan have just cut their first pineapple of the season, grown using an authentic Victorian technique, which they calculate would have cost the equivalent of £10,000. The miniature fruit was grown in the restored Pineapple Pit, in the Melon Yard at Heligan, using the natural warmth of 30 tonnes of manure to heat the complex Victorian structure. Heligan, which now boasts the finest productive garden in the UK, restored the derelict Pineapple Pit after discovering it 20 years ago, covered in ivy and 5ft high brambles. A team of horticultural and restoration experts worked alongside the Heligan Productive Gardens team, determined to unlock the forgotten 70 year old technique of growing pineapples - and they succeeded! 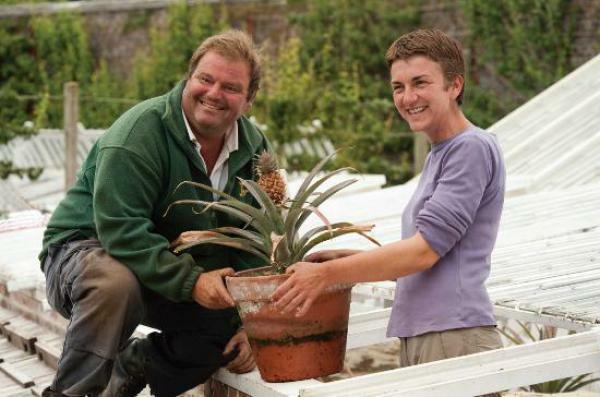 The second pineapple ever grown at Heligan, using the rediscovered Victorian technique, was sent to the Queen by Heligan Director Tim Smit. The first was tasted by the Heligan Gardeners to check it didn't still have a hint of 'farmyard warmth' about it! Rare, exotic and hard to grow, pineapples were a symbol of great status and wealth in Victorian times. A pineapple on your dining table meant you were a person of discernment, style and affluence. The Productive Gardens: Heligan's Productive Gardens are the largest in the UK, and visitors can see fine and rare examples of plants and horticultural expertise. They can also chat to the productive Garden team for insights and tips on gardening. www.lostgardensofheligan.blogspot.com where they can also get gardening tips too.